Rich with scallops and teaming with wildlife, Citrus County is one of the last places in Florida you can collect scallops that are both fun to find and delicious to eat! 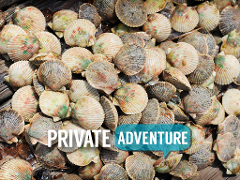 Join us on our small boats for our most exclusive scallop tour! Rich with scallops and teaming with wildlife, Citrus County is one of the last places in Florida you can collect scallops that are both fun to find and delicious to eat! Take your small family on a private adventure of a lifetime! This tour is perfect for a large group of friends or family who love to have adventures together! 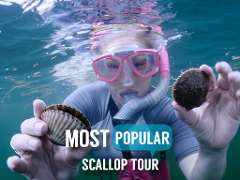 Scallops are fun to find and delicious to eat, and just off the Homosassa River are some of the richest scallop grounds in the state. Two tours combine for a unique excursion! 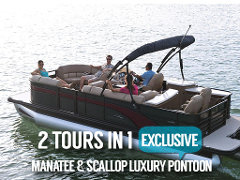 Scallop in the Gulf and Snorkel with manatees in comfort on one of the fastest and nicest boats on the water! Saltwater followed by the refreshing springs make for an extraordinary VIP experience!